Having a ukulele with built in electronics gives many benefits over the standard acoustic ukulele. You will have the option to plug your ukulele into an amp or PA and play with a group of people, adjust your EQ settings, and use the built-in tuner. Because ukuleles have a small body, it can be difficult for them to project loud enough to be externally mic'd. 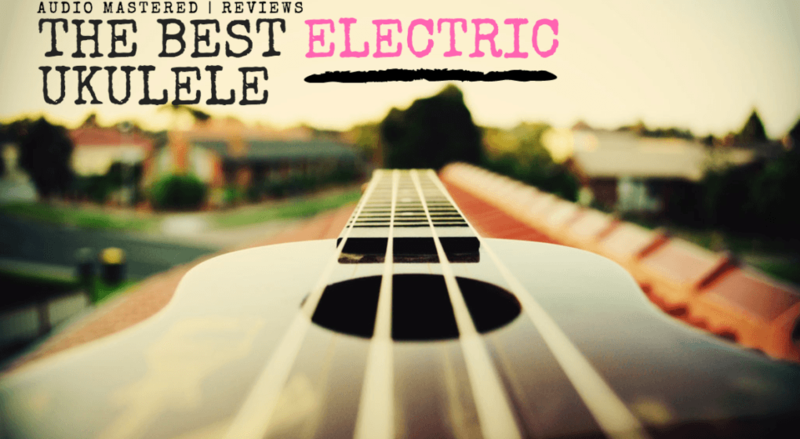 We've put together a list of the best electric ukuleles for the beginner to intermediate. While all of the standard ukulele criteria still holds, there are a few things that need to be taken into account when selecting your electric ukulele. There are a few types of pickups that are typically used for ukuleles and each has its own merits. We'll have a quick discussion of the types of pickups and then move into the reviews! If you aren't familiar with selecting electric-acoustic instruments this will be a good intro. For beginner to intermediate instruments you are usually given three features with your electronics: EQ, volume, and a tuner. You are sometimes given a battery check light to ensure your battery has enough power to run the preamp. The EQ of the electronics is straightforward. They will usually either be a 2 or a 3 band EQ allowing you to adjust the levels of each frequency band to your preference. This is a great feature for altering the tone of your ukulele from song to song to give a more diverse performance. Most of the ukuleles on our list offer a 2-Band EQ with bass and treble adjustments. A chromatic tuner can be very helpful for the performing artist. It will allow you to quickly check the tuning of your uke without having to get out an external tuner. The SBT is a style of pickup that uses a little disc to pick up any vibrations within the ukulele. These picks generally have a warmer more natural tone compared to UST and eliminate any external noise such as arm movements. This pickup is great for any performers as they provide a consistent sound that is resistant to any feedback. It uses a transducer that sits in the bottom of the saddle slot in the bridge. The string vibrations are transferred directly to the transducer providing more of a plugged-in sound. As mentioned previously, they make great performance pickups due to their consistency and ease of use. Active pickups will have a preamp built directly into the ukulele. This allows you to balance the signal and provide a processed signal to whatever you are plugging into. This allows you to maintain constancy with every setup you use. Passive picks have no preamp built in and require an external preamp to get the best sound. The benefit of the passive electronics is it provides you with a more natural, full sound. You can easily distinguish between the two by checking if the electronics require any power to function. Active pickups will be a great option for those looking for constancy and easy-of-use. A tuner can be very handy even if you aren't performing. First up on our list the Caramel CS100. This is the most budget friendly option. The soprano body will give you the classic ukulele tone. The body is constructed out of a striking zebra wood. Zebra wood is known to be similar to maple with good volume projection and excellent voice distribution. It tends to have a little less resonance then maple with a few more dark overtones. The onboard electronics have a 3-Band EQ, built-in chromatic LED tuner, and a low battery light. We love that it comes with Aquila strings (industry standard) and sealed tuning pegs. Keep in my the action may have to be adjusted if you are used to playing with a set up ukulele. Instruments around this price range generally are manufactured with less precision resulting in higher than normal action. Bottom Line: A great ukulele for those on a tight budget who need electronics in their uke. The quality is great overall but may need a few small adjustments to get it perfectly set up. Next up, the Kala MK-TE. This is a Tenor sized ukulele with an Agathis body. Agathis is not an ideal tonewood but is sometimes used in hollow-bodied guitars. It will provide a suitable tone for the beginner to intermediate, but if you are picky about your tone quality you may want to skip this one. The onboard electronics provide a 2-Band EQ and volume control. It also provides a chromatic tuner. It comes with Aquila Nygult strings, so you won't need an upgrade for a long time. 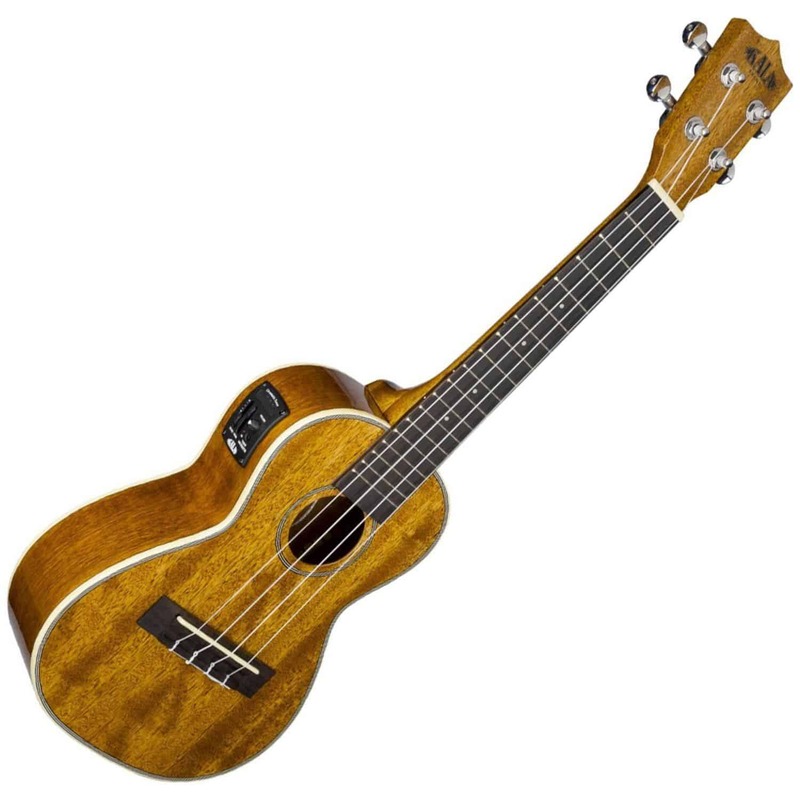 The overall satin finish is aesthetically appealing and Kala has a stellar reputation for producing durable, high-quality ukuleles you can trust. Bottom Line: A decent option. We'd recommend checking out Luna Mahogany below if you want a stronger tone in your ukulele. Next up, the Epiphone Les Paul Electric Ukulele. While the body is made of mahogany with maple top, and the build quality is up to Epiphone standards, the other features on this ukulele is lacking. Unless you specifically want this ukulele for the Les Paul look and aren't concerned with have EQ, volume adjustment, chromatic tuner, or premium strings then this a good choice. The concert size is the best sized ukulele to learn on. It will give plenty of room on the fretboard while still having the classic ukulele sound.​ The passive pickup will allow you to have a full, natural sound and reduces the overall weight of the ukulele. 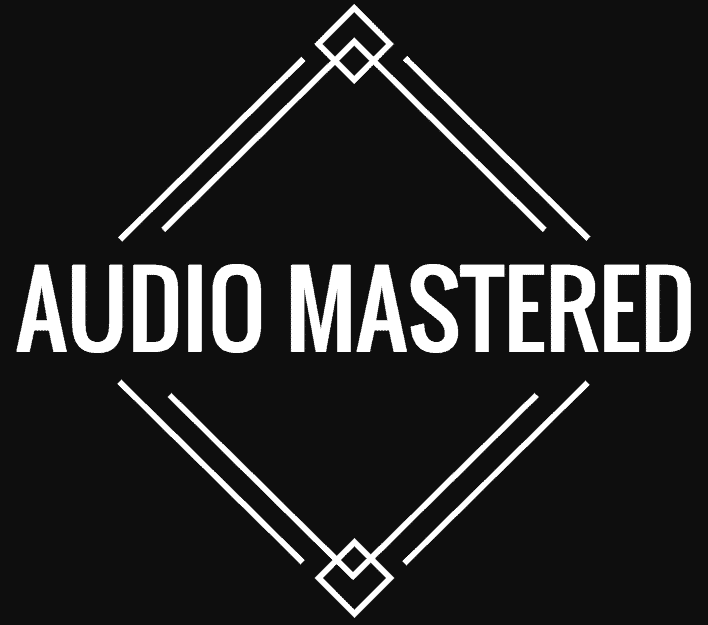 Bottom Line: An okay option for those who aren't concerned with EQ, volume adjustment or a built in tuner. We still think you can find better value for the same price with the other ukuleles on our list. This is a great option for those looking to get a good tone out of their ukulele. It would also make a great ukulele to learn on due to the extra room on the fretboard. The only downside to this ukulele is that it doesn't come with a chromatic tuner. You'll first notice that the visual appeal is very striking. Luna has put a few additional details that increase the aesthetics such as pearl tuning pegs and a tattoo style top. The ukulele comes set up and the action is very playable. The electronics do well for this price range but is lacking a chromatic tuner. The body is constructed out of mahogany with a spruce wood top. This is a typical construction for many intermediate level guitars. The mahogany provides a warm tone, while the spruce tops adds a nice crisp treble. Bottom Line: Great value for your money. If you want a ukulele that looks great and has a great tone, this is your option. The last and favorite on our list: the Kala KA-CGE Gloss Mahogany Concert Ukulele with Electronics. This is one of the best values for the money and is well suited for any level of player. It will be great for beginners as you won't have to upgrade your instrument for a long time and the concert size leaves plenty of room on the neck to learn chords. The mahogany body gives a strong voice over all three bands. The gloss finish with cream bindings gives this ukulele a striking appeal. It comes with the industry standard Aquila Nygult strings which provide the best tone and have a long lifetime. Bottom Line: Our favorite option. If you have the means, you won't be disappointed with this ukulele.